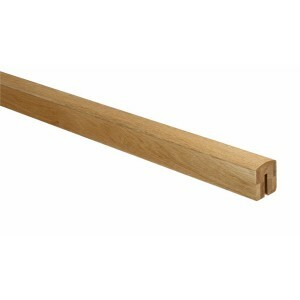 Square profile handrails in a choice of lengths. The Immix range is a premium range of stair parts that offer a great way to refresh your stairs and bring your home right up to date. Instead of the disruption and expense of refitting an entire staircase, this system allows you to simply change the balustrading on existing stairs for a whole new look, although their contemporary look also makes them ideal for new builds. Unique gunmetal connectors are designed to join all stair parts together quickly and easily, saving time and effort, and with no need for any wood-jointing skills. The connectors also provide a stylish finishing touch and help to conceal any imperfections created when sawing the handrails and newel posts to size. Immix stair parts are ideal for a fresh look that will effortlessly add a subtle focal point to your hallway while allowing a natural flow of light due to the glass panels. The timeless charm of oak stair parts combined with contemporary glass panels and metal fixings are the perfect way to create a post to post balustrade for new builds or for refurbishing older stairs.